One of the most requested features for the chat is here! We are really proud to preset our Read & Reply functionality. It does not matter on which device you use the it, you can always reply and see the incoming messages all in one place! So let's take a look what it is and how to use it. Simply head on to your chat page from main dashboard or use this link. From there you can see your own Web Chat Application interface. All the incoming messages across your connected and enabled channels will be displayed here as well you will be able send your messages to the all your channels at the same time or choosing from the list. To reply simply type your message in the field and hit enter on your keyboard or "Send" button. It is really easy to choose from the list which services should receive those messages you want to send, so you can target all chats at once or the specific one you pick. You can always see the status of connected services in your status bar. 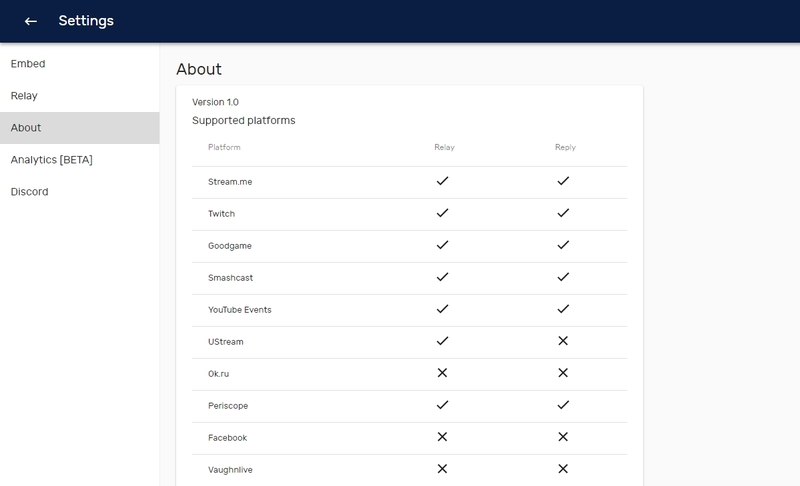 Keep in mind that some services like Periscope and Facebook in my example requires your stream to be live for chat to be able to connect, same applies for most of event based services. If you want to learn if your some service is supported in chat and what features are included you can easily go into Settings About section. The list will only grow and more awesome features will be added to make your simulcasting experience rocking! If you have any feedback regarding your Restream Chat experience or have some awesome features in mind just let us know here! If you will have any questions feel free to contact out vie chat support! Rock on!